In her apron and rubber gloves, the woman of the Fifties has become a cultural symbol of all that we are most grateful to have sloughed off. But what if there was another side to the story? 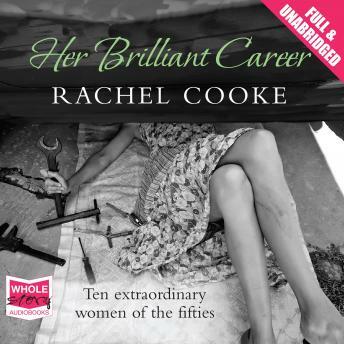 In Her Brilliant Career, Rachel Cooke tells the story of ten extraordinary women whose pioneering professional lives - and complicated private lives - paved the way for future generations. Muriel Box, film director. Betty Box, film producer. Margery Fish, plantswoman. Patience Gray, cook. Alison Smithson, architect. Sheila van Damm, rally car driver and theatre owner. Nancy Spain, journalist and radio personality. Joan Werner Laurie, editor. Jacquetta Hawkes, archaeologist. Rose Heilbron, QC. Plucky and ambitious, these women left the house, discovered the bliss of work, and ushered in the era of the working woman.